We are thrilled to introduce independent apparel line Lomas Brand to the Bunky Boutique men's section! You can expect high quality and seriously soft everyday essentials such as flannels with modern fits, an updated Letterman jacket, and pieces for seasonal layering such as flannels and work shirts. We love the expertly tailored designs and approachable style. Lomas was born in southern California (San Diego, to be exact), where the small team behind the independent label continues to design, source fabrics, print, and market in-house. Check out the collection below along with our Q+A with Lomas Brand owner + founder, Sean Feeney. 1.) What makes you enthused to be partnering with us at Bunky and having The Lomas Brand in the shop? Sean Feeney: I remember when I first walked into Bunky and on display were just these unique styles and cuts from up and coming brands I'd never come across. The styles were clean, timeless but at the same time very fashion forward. The entire store had an overall cohesive vibe to it that really struck a chord with me. I remember thinking "this place is nailing it." So every time I was in town visiting thereafter I would frequent the store and I noticed that though the products would vary, that cohesive and stylish vibe would never waiver. That to me said a lot about the owner (Rachel) who at the time I didn't know. To put it in simple terms Bunky had earned my trust as a customer. So when I started my brand, Bunky immediately became a top target for me to get my brand into. Looking at it now and actually having a presence in Bunky is a surreal feeling, one that leaves me incredibly humbled. Humbled because a store I admire and trusted for its style, admires my brands' style enough to give it such a large presence in Bunky. As a creator of a clothing brand that is the highest compliment you can receive. Partnering with Rachel and Bunky leaves me so enthused because I know that this partnership is based off of a mutual vision and understanding of style. SF: I'm a 3rd generation Phoenician. I grew up in Central Phoenix and attended Brophy College Prep. My dad founded and owned Feeney's Bar and Steakhouse on 12th Street and Maryland. My parents ended up selling it in the mid 80's but the new owners kept the name and its actually still there today as Feeney's. As a kid, my friends and I were always skateboarding through Central and Downtown Phoenix hanging out at Cowtown Skateboards on Camelback and Central. A funny story, when we were young we would skateboard all day, often times skipping meals. One particular day we were hanging out in Cowtown and Trent (the owner) overheard us talking about how hungry we were, though we didn't have any money. Next thing we knew he took the change out of the cash register and gave us enough so that each of us could get a $.99 hamburger from Dairy Queen next door. He was (and is) forever a legend in our group of neighborhood friends haha. My parents, siblings, aunts, uncles, and 13 of my 16 cousins all still live in Phoenix so I guess you could say my roots are very much embedded in the Valley. 3.) Where do you pull inspiration from for your designs and the brand as a whole? SF: Professionally, my inspiration when creating a piece comes from the challenge of finding a balance between - less being more and nothing not being enough- if that makes sense haha. That inspiration stems from growing up idealizing guys like professional skateboarder Jamie Thomas and world renown surfer Rob Machado, who actually lives locally in Solana Beach/Cardiff and I've had the pleasure of meeting a few times. Their influence in the mid to late 1990's era of skateboarding and surfing apparel style I guess you could say mesmerized me. In those days I thought brands like Zero, Toy Machine, and Vans were so cool. If you go back and look at this era you'll find it was a time of simple, stylish looks that symbolized a lifestyle that represented skateboarding, surfing, a love for just living out your passion, whatever it may be. The style wasn't so much about flash but rather it took a simple logo and put it on a contrasting solid color garment and what you got was this clean and balanced, eye catching final product. Growing up immersed in this era, I think that look just inherently comes out in my collections' designs. As I got older my idol became Yvon Chouinard and the clothing brand he founded, Patagonia. Yvon made Patagonia reflective of himself on a stage for everyone to see. His passions, his cares, his standards for clothing, even his own personal story. He inspired me to do the same, which if you're a private person like I am, is a very difficult thing to have to do. Patagonia inspired me to never use cheap material. They've taught me the importance of the material used and the lasting effect that reputation can have on your brand. On a personal side, my inspiration comes from my dad. He came from very little and left home when he was really young but determined his own future by relying on himself. Him and my mom raised my two older siblings and I with the understanding that they would provide for us a loving home and a great education, everything else was up to us. So when I started The Lomas Brand I looked to relying only on myself. I took my life savings I'd stored from 8 years in sales and self funded this venture. Everyday my inspiration when I wake up is knowing there is no safety net below to catch me if I fail, no one else's money on the line but my own to lose, and the success of this venture falls entirely on my shoulders. The best advice my dad has ever given me came from his days owning Feeney's: "Sean - A Miller Lite tastes the same anywhere you go, but its the way you treat people and the pride you take in your craft that makes them come back." SF: The reputation for quality and comfort of the items in my brand's collection is one of the things I'm most proud of to date. The material an item is made with is as critical, if not more critical, then the aesthetics of that certain piece. If you think about it, as a consumer, you only get to see the way you look in an article of clothing at most lets say 10% of the time whether that is through a mirror or in a picture. But you feel that item's comfort and fit 100% of the time while you wear it. And part of style is looking effortless and confident and that is directly derived from feeling comfortable in what you are wearing. That is why the months prior to opening for business I spent tirelessly researching, sampling, washing/drying, sewing different fabrics and blends of fabrics to determine which ones would be used in the collections. Its no coincidence that the biggest brands in the business like Patagonia follow this same formula. 5.) What is a quirky or unique tidbit about yourself? SF: Not a lot of people know this but The Lomas Brand is actually the second clothing brand I've started. The first one I started when I was 16 called Revival Clothing Company. It was just t-shirts and I sold them out of my backpack in high school. I had NO clue what I was doing but literally took out the yellow pages and found a beat up t-shirt printing place in South Phoenix and somehow made a few t-shirts on a shoe string budget. My mom recently found one of the shirts in their attic and sent it to me. I now have it framed in my work studio to remind myself that I'm following a dream I set out to conquer almost 15 years ago. 6.) What kind of items have you picked up from Bunky over the years? SF: Bunky is my go-to place to get gifts when I'm in town. In my family there is a running joke about how I am a last minute Christmas shopper. Last year a few days before Christmas I stopped into Bunky and got my sister's gift, my brother's gift, a tree ornament for a tree decorating party I was going to, and a necklace for a girl I had been dating at the time. So, needless to say I'll be back doing that same thing again this coming Christmas haha. Styling: Layer the Lomas Henley under the Manchester or Costa Flannel, PHX Fitted Hat (Left). 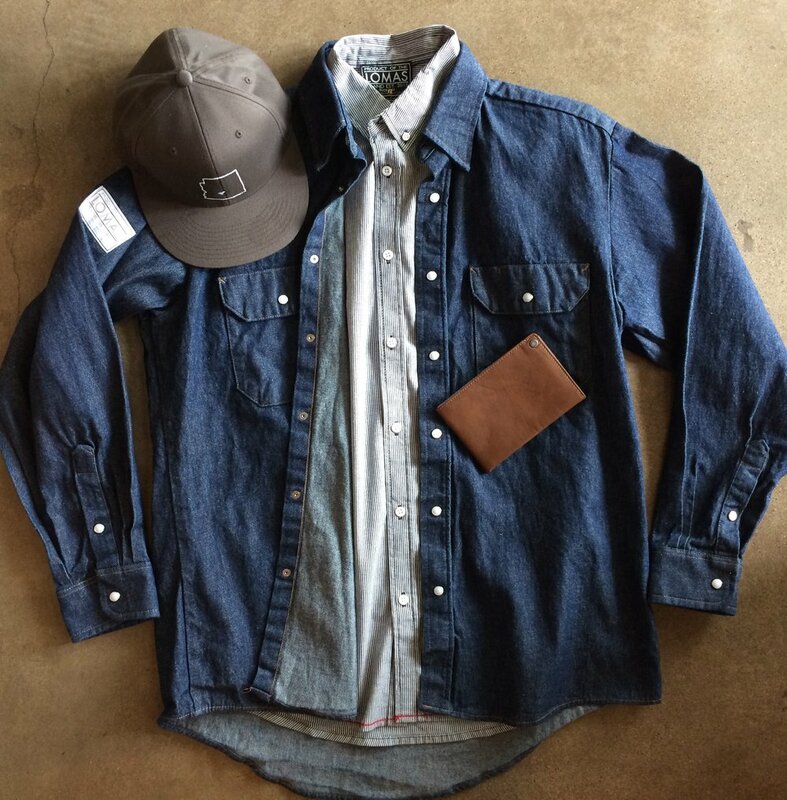 Pair the Classic Shirt with the Workman Overshirt, AZ Love Fitted Hat and Leather Travel Wallet (Right).